Next to the kitchen, the laundry room was the worst room in the house to me. It was squishy, dirty and dingy. I would seriously run in there to do laundry and run back out. Even my kids were scared to go in there! Haha! We had recently replaced all of the flooring on the main level of the house but stopped before the laundry room because we noticed it had a few layers of flooring! I was slightly horrified, but one day while my husband was at work I went crazy on that beige tile! A crowbar, hammer and a few hours later all of the flooring was gone! There was a layer of tile, subfloor and linoleum that I tore up. I also removed the desk area. It was such a small room that I felt like it wasn’t very functional right in the middle of the room. Plus, it was just a storage space for junk. I was so glad to see it go! Next, I cleaned up a little and got ready to paint! I painted the walls Martha Stewart Flagstone Grey and the ceiling Glidden White on White. I used paint that included primer and used two coats on both the ceiling and the walls. After the walls had dried overnight, I couldn’t wait to paint those cabinets! I knew the only way I was going to refinish my cabinets was using Chalk Paint® Decorative Paint by Annie Sloan. I am absolutely obsessed with it! It is so easy to use, I didn’t have to sand my cabinets and it left them with a beautiful finish. I taped off the cabinets, removed the doors and hardware and wiped them down. I used a brush to apply Chalk Paint® Decorative Paint by Annie Sloan in the color Duck Egg Blue to hard to reach places and used a roller for all of the flat surfaces. After the paint was completely dry, I applied Clear Soft Wax using the Annie Sloan Wax Brush. I added some hardware and they were good as new! Once all the painting was done, we headed to Lowe’s for flooring and wall treatments! There were so many flooring options to pick from, but we finally settled on this Style Selections Leona Silver Glazed Porcelain Tile. It completely transformed the room! It is so sturdy and is the perfect tile for a bathroom, laundry room or any high traffic area. We used a white grout between the tile and sealed it. I absolutely love how it turned out! After the floor was completely dry, we covered each wall in 4-ft Primed Hardboard Double Bead Wainscot. I love that it comes pre-finished! To install the bead board, we marked where any outlets were, cut them out with a jigsaw, spread some silicone on the back and secured it to the wall with finishing nails in the studs. To finish off the top of the wall treatment, we attached 1″x4″ pine boards above the bead board and 1″x2″ pine boards over the top. We also attached some new trim and painted everything white. I love the contrast of the wall treatment and the wall color! We considered building some sort of cubby or locker system, but found this darling bench and baskets at Lowe’s! It is the perfect height for our kids to sit on and put their shoes on. The baskets are also perfect for storing hats, gloves, shoes, etc. It works perfectly for our space! You may remember that crazy pile of mops and brooms, so to keep things organized, I used some of our 1″x4″ pine, painted it white and attached some clips to hold my brooms and mops. It hides perfectly behind the door! My favorite part of the entire room has to be the new Kenmore Washer and Dryer from Sears! My previous washer and dryer were so old and worn out. I often had to wash loads of laundry twice to get our clothes clean and almost always dry everything more than once to get the load completely dry. It was a nightmare! With three kids, (4 if you count my husband 😉 ) I have plenty of laundry to do! This washer and dryer have literally changed my life! The washer has Smart Motion® Technology that has 6 different washing motions for superior cleaning and care for special fabrics. I also love the express wash setting when I have a small load of laundry that I need clean in a hurry (just 24 minutes and they are clean!). Trust me, with a newborn who goes through four outfits a day, this is awesome! It is also ENERGY STAR® qualified, so it saves money and energy while protecting the environment. It is that amazing. The dryer has the latest Sensor Dry technology to prevent over-drying clothes. I can’t tell you how many times my husband would complain that I had shrunken his pants or sweaters, but thanks to this wonderful dryer, I don’t have to worry about that ever again! I love it! There is also an express dry cycle when you need dry clothes in a hurry or a steam setting so you can throw in some wrinkly clothes and have them come out smooth and wrinkle free in minutes! I also love how easy it is to change the settings if I have something I want to wash a little longer or change the water temperature. All it takes is the push of a button! They are also so spacious that I can wash and dry larger loads of laundry. It doesn’t get much better than that! 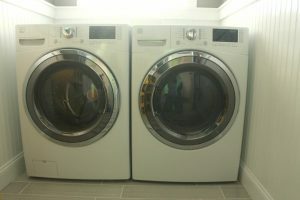 You can read more about our washer and dryer HERE. I installed some new blinds we found at Lowe’s to let as much natural light in as possible. To finish it off, I added some cubbies I found at a thrift store for $20 (spray painted to add a pop of color) and a new rug! Elyse, what a lovely transformation! Great decision to bravely tear out the vanity cabinet. You were able to expand your useable space and achieve greater function without it. Love the bead board. Happy Laundry Day! WOW WOW WOW ...LOVE THIS. What is that cool yellow cabinet? We found it at a local thrift store. We are pretty sure it held wine bottles. Perfect to hold all of our shoes! I love your laundry room!!! Want to come and re-do mine?? Love how it turned out. Where did you get your shoe cabinet?